The culinary mating of hot chiles and chocolate was unforgettably revealed to me in the mercado in Oaxaca, where the molinos–grinding mills–in adjacent stalls were processing cacao beans in one stall and mole paste with chiles in the other. In this ancient city, I had this sudden epiphany that, in prehistoric times, ancient cooks would have naturally experimented with combining two of their favorite crops. cocoa beans embedded in it. After the Spanish conquest of the Aztecs, the story of how chocolate was added to chile sauces does not involve warriors, but rather nuns. Legend holds that mole poblano was invented in the sixteenth century by the nuns of the convent of Santa Rosa in the city of Puebla. It seems that the archbishop was coming to visit, and the nuns were worried because they had no food elegant enough to serve someone of his eminence. So, they prayed for guidance and one of the nuns had a vision. She directed that everyone in the convent should begin chopping and grinding everything edible they could find in the kitchen. Into a pot went chiles, tomatoes, nuts, sugar, tortillas, bananas, raisins, garlic, avocados, and dozens of herbs and spices. The final ingredient was the magic one: chocolate. Then the nuns slaughtered their only turkey and served it with the mole sauce to the archbishop, who declared it the finest dish he had ever tasted. It’s a nice story, but more likely mole was invented by the Aztecs long before the Spaniards arrived. Since chocolate was reserved for Aztec royalty, the military nobility, and religious officials, perhaps Aztec serving girls at the convent gave a royal recipe to the nuns so they could honor their royalty, the archbishop. At any rate, the recipe for mole poblano was rescued from oblivion and became a holiday favorite. 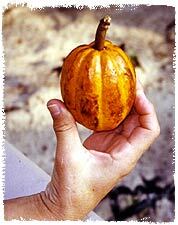 Although chiles were brought to Europe on the return of Columbus’s second voyage in 1496, it took chocolate longer to arrive. In 1544, a group of Dominican friars led by Bartolomé de las Casas brought a group of Kekchi Maya nobles from Guatemala to the court of Prince Philip in Spain. Among the presents the Maya brought him were feathers of the beautiful quetzal bird, clay vessels, lacquered gourds, various types of chiles, and bowls of beaten chocolate. 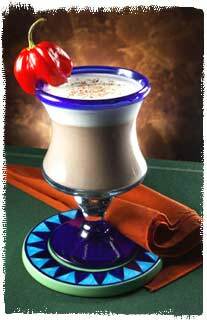 Apparently this occasion marks the introduction of chocolate into Europe, and according to various historical documents, the drink was very popular, and first commercial shipment of cacao beans from Veracruz arrived in Seville in 1585. 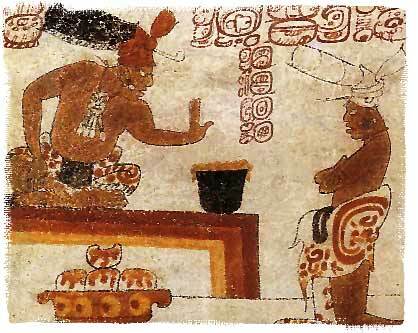 A nobleman tests the heat of his chocolate in this painting on a Late Classic Maya vase; note tamales covered with chocolate-chile sauce below him. All of these ingredients were boiled together and then frothed with a molinillo, the traditional Aztec carved wooden tool. 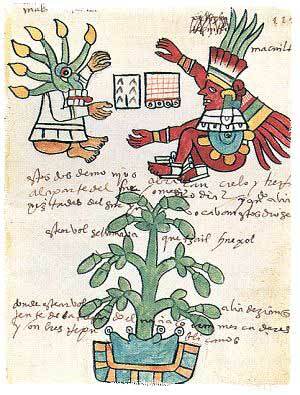 The achiote was used to redden the color of the drink. 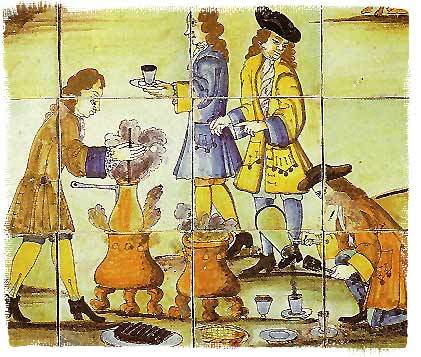 A paste was made of these dried ingredients on a heated stone and then it was boiled to make hot chocolate. 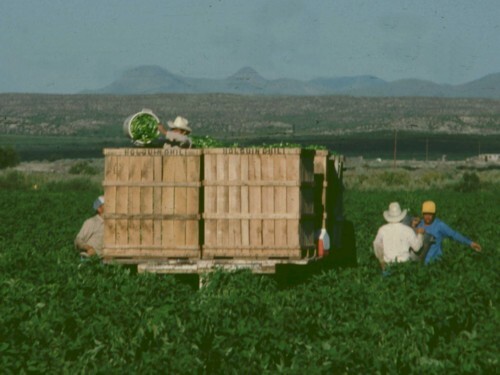 Considering the amount of chile, it was only mildly spicy–the start of an ominous trend. 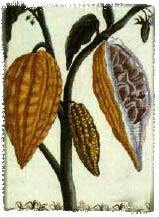 As the popularity of chocolate exploded all over the world after 1700, chiles disappeared as a major ingredient in chocolate drinks, candies, and desserts. No one knows why. 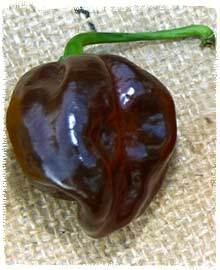 Of course, it was still used in traditional Mexican mole sauces, but in other parts world, people wanted sweet, not heat, in their chocolate. a little bit like an ear), and is known as “xochinacaztli” (Nahuatl) or “orejuela” (Spanish). Today, in 2003, a web search for “spicy chocolate” on the Google search engine yields nearly 1400 citations and hundreds of recipes from everything from spicy chocolate popcorn to spicy chocolate chip pumpkin cookies. 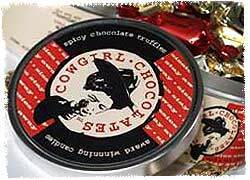 In the U.S., gourmet food companies like Cowgirl Chocolates, Amour Chocolates, and Kato Productions manufacture chile-chocolate truffles and habanero chocolate bars. 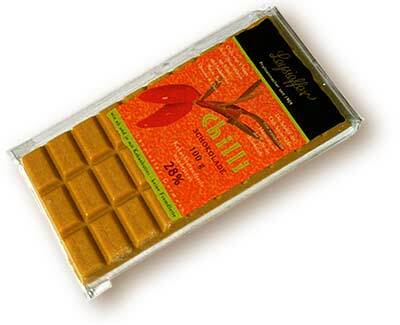 In Europe, Weisse Schokolade mit Chili (White Chocolate with Chile) is made by Leysieffer, a manufacturer of fine sweets located in Osnabrück, Germany. Chili Traum (Chile Dream) are Dark Chocolate Chili Truffles made by Hamburg’s celebrity baker and chocolatier Adolph Andersen, who has shops in the best locations, including the city’s top hotels. When owner Adolf Andersen created his dark chocolate chile truffles, he was inspired by the movie Chocolate. Our German correspondent, Harald Zoschke, comments: “When I met Andersen, he told me the most important secret: Use the finest ingredients, especially the best chocolate that you can find. Only great chocolate makes great truffles. Anderson uses Valrhona, a very expensive but pure and delicious dark chocolate from France. The truffles have an intense chocolate flavor, melt in your mouth and have just the right kick of heat. 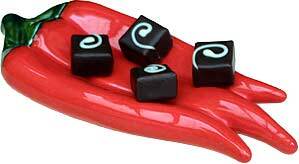 Their German online shop offers various assortments of their pralines. 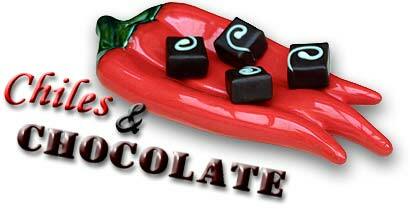 We have quite a few chocolate-chile recipes in our databases, and they are easy to find. Simply go to our Recipe Search and search for the ingredient “chocolate.” Many more are available by searching Google or Yahoo for “spicy chocolate.” Below are my favorite sweat heat recipes combining chile and chocolate. Combine the chocolate, honey, vanilla and vodka in a small pitcher. Pour into two long stemmed glasses or Irish coffee glasses. Float the cream on the tops of the two drinks. Dust with a pinch of Cayenne pepper and garnish with cinnamon sticks, or dust with grated chocolate and garnish with dried red chiles. Cut them lengthwise and fix them to the edges of the glasses. New Mexican red chile is the heat source in this tremendous treat. With the combination of baking chocolate and white chocolate, it’s exceptionally wonderful to munch on. Try substituting 2 teaspoons of cayenne powder to heat the truffles up even more. Use a double boiler or fill a 3-quart saucepan three-quarters full with water, and heat until the water is almost boiling. Place both chocolates in a smaller saucepan, then melt them over the hot water, stirring until smooth. Add the sugar, red chile, cinnamon, and milk, mixing until very smooth. Remove the mixture from the heat and let it cool until it is shapeable. Shape the chocolate mixture into 1-inch balls, then roll them in the nuts. Chill the candy in the refrigerator in an airtight tin. If you are not using chips, cut the chocolate into about pea-sized pieces. Put the chocolate in a stainless steel bowl and set it over a saucepan which is filled half with water (double boiler). Heat the water just below boiling and turn of the heat. The chocolate will start to melt. Heat the whipping cream in a small saucepan until it just comes to a quick boil. Add the vanilla and the hot sauce, and let cool for 5 minutes. When the chocolate is completely melted, stir until smooth with a hand whisk or an electric mixer. Pour the whipping cream mix over the chocolate and mix until both liquids are perfectly blended (less than 2 minutes; don’t overdo it). Again, use either a hand whisk or an electric mixer. Pour the hot mixture into the prepared pan or into confectioner’s cups and refrigerate for a couple of hours. If you did not use confectioner’s cups, cut the cold truffles into small pieces and either enjoy right away, or store them in airtight containers in the refrigerator. This stunning ice cream is from Suzy Dayton, former pastry chef at the Coyote Cafe, who served it at the Santa Fe Wine and Chile Festival, where we collected the recipe. 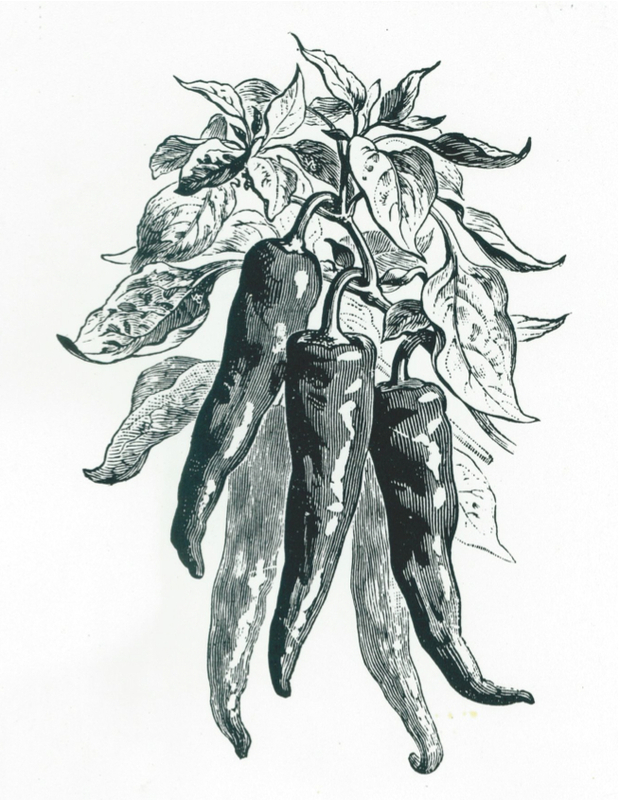 Cover the chiles with hot water and let them soak until pliable, about 30 minutes. Remove the chiles and discard the stems and seeds. Place the chiles in a blender or food processor and puree finely with a little of the soaking water. Stir in the cinnamon and cloves. Melt the chocolate in a double boiler over hot water. In a medium saucepan, combine the milk, cream, and sugar. Split the vanilla bean and scrape some of the seeds into the mixture. Bring the mixture to a boil. While whisking the egg yolks in a bowl, pour in about one third of the hot milk mixture. Reheat the remaining milk and add the egg yolks. Heat for 1 minute, whisking constantly. Strain the mixture into a bowl. Stir in the chiles and chocolate, and chill for 15 minutes in the freezer. Freeze in an ice cream maker according to the manufacturer’s instructions. Serve garnished with a cinnamon stick and the shaved chocolate. Although mild to the taste, the flavor of the chile really comes through in this pie. Sift all the dry ingredients together into a food processor. Add the shortening to the flour mixture in the processor. Cut the butter into chunks and add to the food processor and process until it is cut into very tiny pieces, about 1 minute. Add the water and continue to mix until the dough wraps itself around the blade and forms a ball. Wrap the dough in plastic and refrigerate for at least ½ hour. Pastry can be kept in the refrigerator for about a week or it can be frozen for several months. If frozen, defrost slowly in refrigerator before using. Line a 9-inch pie pan with the chocolate pie pastry and set aside. Combine the butter and hot fudge in a bowl, cover with a saucer, and microwave on high for about a minute. Set aside. Combine the eggs, corn syrup, sugar, fudge mixture, and vanilla in a bowl. Stir in the pecans and pour the mixture into the pie shell. Bake for 15 minutes, then reduce the heat to 350 degrees and continue baking for an additional 30 minutes, or until the edges are set. 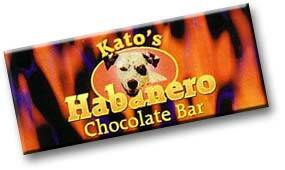 Red chile and chocolate is an elegant combination. The zucchini makes this cake extra moist and extra delicious. We guarantee you’ll want to have an extra piece! Preheat the oven to 325 degrees F. Sift together the flour, cocoa, baking soda, and salt in a large mixing bowl. Set aside. In a separate bowl, cream the butter, vegetable oil, and sugar. Beat with an electric mixer until the mixture is light and fluffy. Beat in the eggs, one at a time. Next, add the vanilla and red chile. Mix in the dry ingredients, alternating with the buttermilk. Stir in the zucchini. Pour into a greased 13x9x2 inch pan. Sprinkle the top of the cake with the chocolate chips and walnuts. Bake the cake for about 55 minutes. Cool the pan on a wire rack.